Consistent quality and safety are of the utmost importance to Magellan’s Gift™ Micro Soap Company. Soaps are cured for at least four weeks. This makes the bar harder and longer lasting. Before a batch of soap is released for sale, it is tested for three consecutive days by three skilled soap testers. The bars are best used within three months for full scent, especially those containing citrus essential oils. In addition to detailed work on batch quality and good manufacturing procedures, our bar soaps have smooth beveled edges for a better shower experience. Make sure to rest your soap where it will dry between uses for a longer lasting bar. We now have Magellan's Gift™ approved soap saving holders for sale on this website. Some of the soaps contain nut oils which may be allergens to some, so if redness or irritation occurs, discontinue. Keep out of eyes. If you have sensitive skin, try wetting the bar and applying a small spot under your arm. Check for sensitivity in eight hours. Watch carefully in the shower for mermaids, giant squids and other old world sea creatures. This soap has been known to let your mind travel to faraway places! 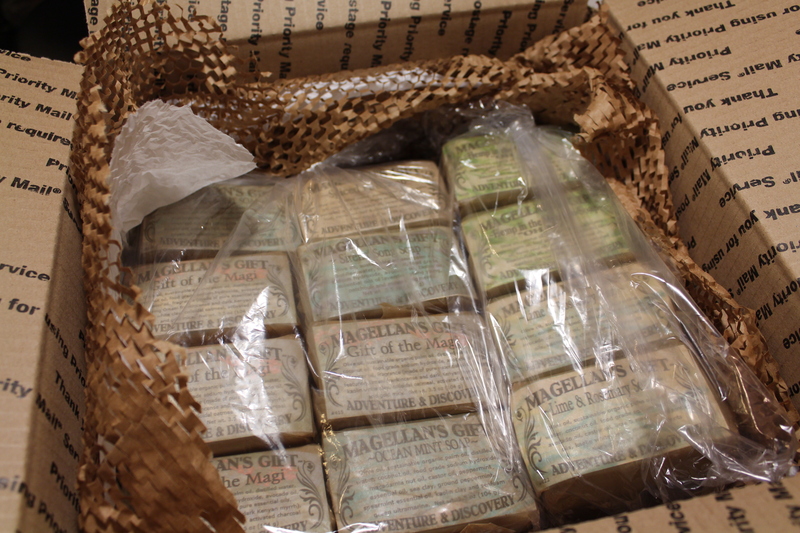 Magellan’s Gift recycles supplier’s packaging and wraps soap in compostable eco-deli wrap. Next we hope to print with more earth friendly ink. All paper has at least some recycle content. Hand stamped artisan bags are available for sale for gift giving. See Gift Packaging under Products.